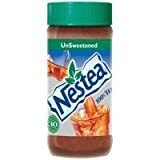 Nestea Iced Tea is a popular iced tea from Nestea, a division of Nestle Waters. The caffeine content listed above is for their traditional bottled Iced Tea with Lemon. 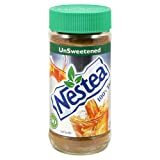 Nestea has recently ended their agreement with Coca Cola and reformulated all of their bottled teas. According to Nestea customer service. All of their teas (except for Red Tea) range from 4mg to 5mg per 8 fl.oz. serving, which is less than they contained when Coca-Cola was producing the teas. Looking at the ingredients below, it appears that Nestea Iced Tea now contains very little actual tea, but a lot of preservatives. Even their non-diet varieties contain artificial sweeteners. 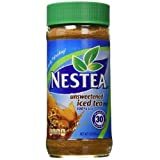 Nestea Iced teas are generally available in 500ml bottles as well as 20 fl.oz. bottles. It appears that their powdered iced teas are gradually being phased out and instead Nestea is promoting their liquid tea water enhancers as their replacement. Sugar content: 28 grams (per 20 ounces). How Does Nestea Iced Tea Compare? Nestea Iced Tea contains 0.65 mgs of caffeine per fluid ounce (2.20mg/100 ml).